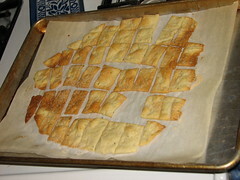 I found a recipe for Crisp Rosemary Flatbread at Smitten Kitchen and decided to try it as crackers. The recipe is from the July 2008 issue of Gourmet magazine. I made a few small changes to the original. Preheat oven to 450°F. Preheat a heavy baking sheet on the bottom or middle rack. I used the bottom rack. Fresh rosemary really does make a big difference over dried. 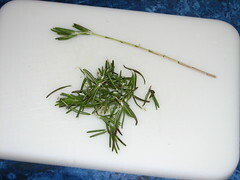 Pull the leaves off a stem of rosemary, starting at the top and pulling down. Discard the stem. Finely chop the leaves. A few larger pieces are fine. Makes for a more distinctive cracker, don’t you think? 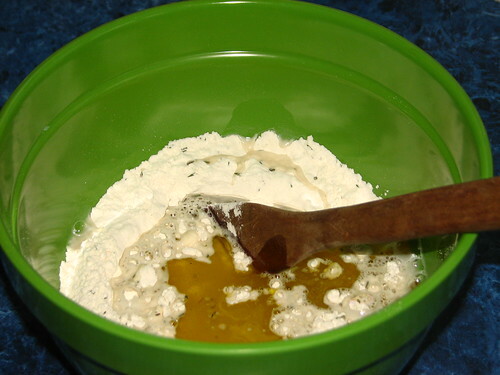 Stir together flour, chopped rosemary, baking powder, and salt in a medium bowl. Make a well in center, then add water and oil and gradually stir into flour with a wooden spoon until a dough forms a ball. Knead dough gently on a work surface 4 or 5 times. 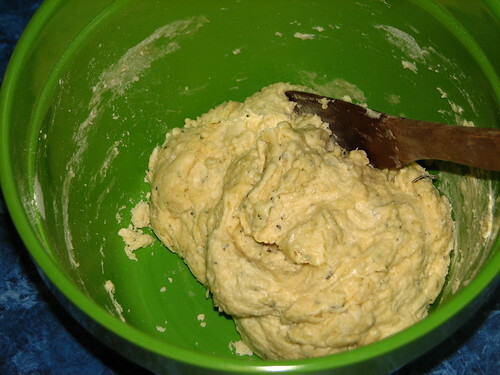 Pull the dough apart, making three pieces. 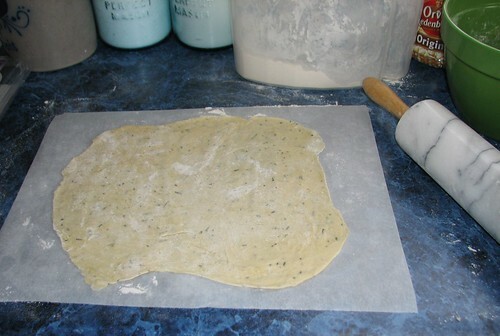 Working with one piece of dough at a time, roll the dough so it is evenly thin. 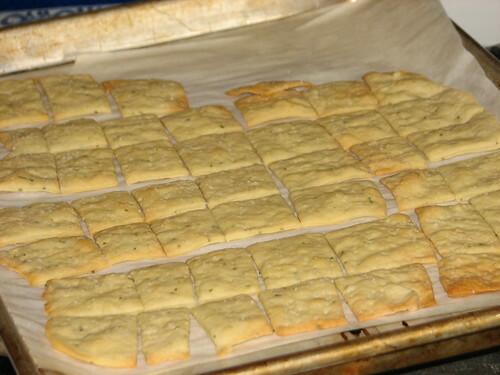 Thicker parts will take longer to cook and you’ll end up with thin dark crackers and thicker not-completely-baked crackers. A particular thickness isn’t so important, just so it’s even. I rolled the dough on the parchment paper, so it was easy to transfer the whole thing to the cookie sheet when ready to bake. Remember: that preheated cookie sheet will be HOT! 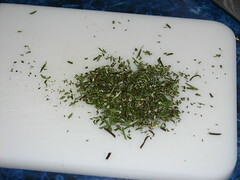 Lightly brush top with additional oil. Sprinkle with sea salt. 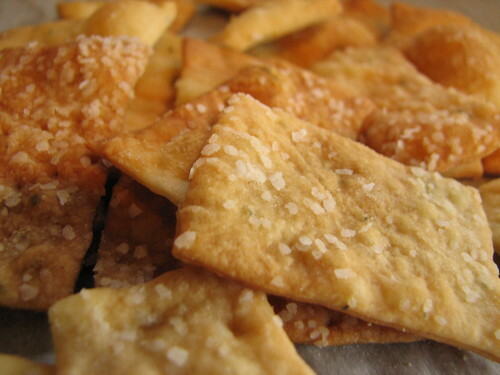 Cut the dough into the size crackers you want. Slide dough, still on the parchment paper, onto preheated baking sheet and bake until pale golden and browned in spots, 8 to 10 minutes. 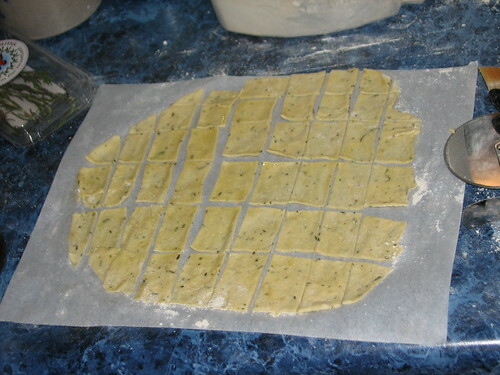 Transfer crackers (discard parchment) to a rack to cool, then make 2 more sheets of crackers (1 at a time) on fresh parchment (do not oil or salt until just before baking). The first batch was a little too crisp. I was doing something else at the time and let it go an extra minute. Check it early and take it out before it begins to turn dark. The dark ones were still delicious, and we ate them, but the lighter ones were nicer. The second batch was better. This batch was salted a bit too heavily. Less is better. Delicious as a snack, but this evening I plan to serve them with my cheesy potato / sausage soup. Check out Smitten Kitchen for more delicious recipe inspiration. 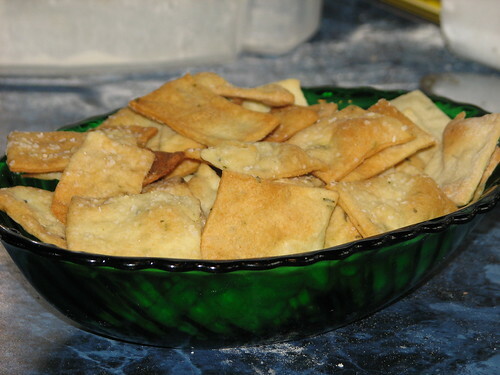 This entry was written by ~~Rhonda, posted on March 30, 2009 at 1:05 pm, filed under Recipes and tagged crackers, crisp rosemary crackers, recipe. Bookmark the permalink. Follow any comments here with the RSS feed for this post. Post a comment or leave a trackback: Trackback URL. Just getting caught up on your blog – these look wonderful!